El Museo Latino Letras y Voses This Saturday! We know you’re all planning on attending the second installment of the UNO Writer’s Workshop Reading Series tonight at 7:30, which will feature poet and translator, Carl Phillips. However, if you’re looking for even m0re literary entertainment, then you should consider attending El Museo Latino’s Letras y Voses/Letters and Voices this Saturday, September 20th, at 1:00 p.m. El Museo Latino is located at 4701 S. 25th St. Omaha, NE. 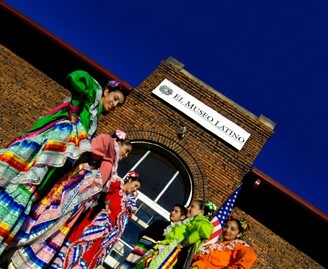 This museum is dedicated to preserving and showcasing Latino art and history, and it is also the first museum of its kind in the Midwest between Chicago and Denver. Lisa Sandlin, who is a Creative Writing instructor and a sponsor of 13th Floor Magazine is involved with El Museo Latino, and always encourages her students to check out an integral part of Omaha’s literary and ethnic community. The featured readers for this event will be Miguel M. Morales, Mario Duarte, and Gustavo Adolfo Aybar. This is a great opportunity to attend a reading series that has and emphasis on how culture and literature can blend together. The museum is a great place to view some exhibits of Latino art and history, and to hear some talented authors showcase their work. If you’re interested, then don’t hesitate. We look forward to seeing you tonight in the Weber Art Gallery and on Saturday at El Museo Latino! Don’t forget to send in your submissions! The deadline is October 31st! ← Don’t Forget About the Reading Series!